The Rathmore clubman made his championship debut in the green and gold in 2004 against Clare and went on to play 70 championship games for his county in a career spanning fourteen years. O’Mahony, who played 85 League games for the Kingdom, endeared himself to supporters down through the years. On Monday he released the following statement: “Today I would like to announce my retirement. I feel the time is now appropriate for me to step away from the Kerry team. “It’s been an absolute honour for me to wear the green and gold jersey for Kerry for the past 14 years at senior level and I leave having great respect for all the talented players I have shared my footballing career with. “I am extremely grateful for all the support my teammates gave me down through the years and I have made friendships for life. “I have been incredibly fortunate to represent my Club (Rathmore), County, Province and Country over the years. It was an honour to share the dressing room with such brilliant players throughout the last 14 years with Kerry. Kerry football manager Eamonn Fitzmaurice congratulated the 36-yearold Garda on his career so far. “Aidan was an incredible servant to Kerry and gave everything he had to the cause over a career that stretches back to the 2003 season when he was first brought into the squad by Paidí (Ó Sé),” he said. 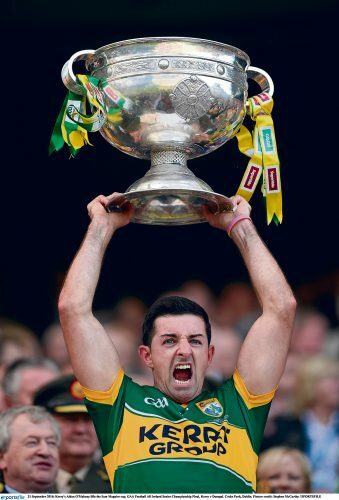 “He was ferociously proud of representing Kerry and this was clear every time he put on the Green and Gold. “When Jack (O’Connor) took over in 2004 Aidan got his opportunity early in the League and he did not leave go of that jersey afterwards. 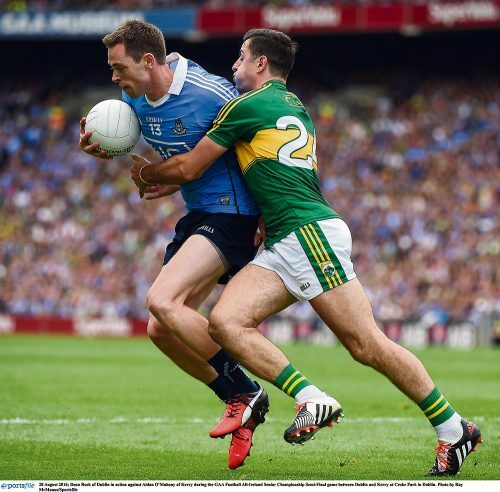 “He ended up winning the first of five All Ireland medals the following September. “He has won it all in terms of individual and collective honours. Over the years he has played in every defensive position for Kerry and performed every role to distinction from man marker to attacking half back, from a holding centre back to a sweeper in recent years. “He was the ultimate pro in terms of the way he prepared himself for training and matches on and off the field. He led by example and was a driving force in the gym and on the pitch. He took pride in excelling at any physical work. Throughout his career he defied western medicine when returning from injury. “He pushed himself to the limit and beyond to get back as quickly as possible. For the medical team trying to hold him back as he fought to return to play was like trying to keep the tide out. His leadership was of particular importance in the last few years as a lot of younger players have been integrated into the panel. “He passed on the baton and helped these players to understand what it means to be a Kerry footballer. “Honesty underpinned everything he did and his selflessness manifested itself in the way he was happy to advise and encourage everyone, even the players he was in direct competition with for a position; a rarity. He personified leaving the jersey in a better place. “Aidan was a warrior for Kerry right up until the last minute of his last game for Kerry last August. I wish him and Denise all the best for the future.” Chairman of Kerry County Committee, Tim Murphy said that O’Mahany, a two-time All- Star winner, had one of the ‘most exciting and fruitful’ careers in the Kingdom’s history. “Aidan was an uncompromising defender whose performances on the field of play rallied both team mates and supporters alike. His personality and character is such that he assumed a natural leadership role on the team and always led by example,” he said. Meanwhile former Kerry manager Jack O’Connor recalled the first time that he utilised the then-23-year-old in the 2004 campaign. “Kerry had been bullied by the likes of Tyrone, Armagh and Meath three years in a row so we needed a new harder edge if we were to compete at the top table,” he said. “Aidan O’Mahony fitted that bill perfectly. He was teak tough and fearless. The tougher it was, the better he liked it. The likes of himself and Paul Galvin set the tone early on that year in our two battles in the Munster championship with Limerick. “He often sailed close to the wind but that was the only way he knew how to play. “Aidan had a great temperament for the big day and he marked some of the best forwards in the country over the years. “Even in 2005 when Tyrone beat us in the final he more than held his own against Steven O’Neill who won player of the year. “His aggression and never say die attitude was an inspiration to those around him. To be still playing at the very top at 36 years of age is truly remarkable in this day and age and is a tribute to the physical shape he kept himself in. In an era when many players are finished at 30, Aidan has defied the odds. He is one of the last links to the team of 2004. Now only Gooch remains.